Obama always wanted to be a Hollywood personality. Now he’s getting millions to fulfill his dream and still try to influence people. Michelle and Barack Obama have signed a multi-year contract with online-streaming giant Netflix to produce and write documentaries and shows. While financial details weren’t disclosed, the bombshell deal begs the question: Will the Obamas be paid in pallets of unmarked bills covertly dropped off in the middle of the night à la Barry’s beloved Iran Nuclear deal? As BizPac Review has reported, Barack Obama wants to follow in the footsteps of President Trump by becoming a reality-TV star with Netflix, for which the Obamas will produce and appear in shows that will chronicle their lives after the White House. While Obama does not necessarily plan to use the huge Netflix platform to criticize Trump, he does plan to discuss many of the issues he championed, including climate change, immigration, health care, voting rights, and foreign policy. So in other words, Obama wants to continue his failed presidency to a third term via streaming video. And it’s no coincidence that this Netflix partnership was clinched just as we’re heading into the critical 2018 midterm elections. 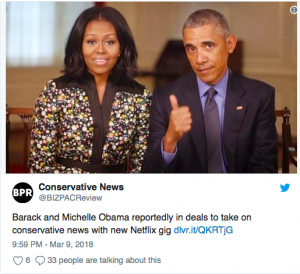 Not surprisingly, the Obama-Netflix partnership fueled mass cancellations and some hilarious reactions on social media. One woman wondered how the Obamas will be able to crank out their leftist propaganda from jail.